Explosives and Pyrotechnics Market size was USD 4.57 billion in 2015 and is anticipated to grow at 4% CAGR to 2025. Increasing mining operations in the U.S., Australia, Russia and South Africa along with rising consumer demand for outdoor cracker shows in sports events and personal events such as weddings, is analyzed to be the key factor propelling the global explosives and pyrotechnics market size over the forecast timeframe. The global mining industry was approximately USD 400 billion in 2010 and is forecast to reach to reach USD 700 billion by 2025. Blasting and explosives technology is an integral part of any mining process. It is used in both open pit as well as underground mining operations. Coal mining is one of the biggest industrial segments in 2015. Energy undersupply in many countries along with growing population is one of the major factors driving the coal based energy generation demand. This will ultimately propel industry growth over the forecast timeframe. Moreover, minerals and ores mining has picked up pace in the past few years in Africa, Latin America and Asia Pacific owing to further complement growth. Arms and ammunition industry has grown significantly in the past few years. Hunting activities in Europe and the U.S., political unrest in Africa, Middle East & Europe, sports and increasing defense spending are some of the factors forecast to positively influence the arms and ammunition demand by 2024. The global military spending was roughly around USD 1.5 trillion in 20210 and is estimated to reach USD 3 trillion by 2025. China, India, the U.S., and European countries have substantially increased their arms and ammunition spending in order to strengthen their armed forces. Furthermore, growing need for technology advancements and smart weapons will further complement explosives and pyrotechnics market size by 2024. Secondary explosives such as TNT, RDX and HMX are produced and used in large quantities for open pit & underground mining, construction and in military applications. Noise and pressure released in the blast are also substantial and cause harm to humans, animals and the environment. The explosion bi-products can be toxic in nature and have adverse effects on human and surrounding health. Additionally, gases, chemicals, noise and dust in mining area along with high temperature situations pose hazardous working environment to the workers. All these factors have led to formulations of stringent environmental legislations from regulatory body including the EPA, obstructing the market share. Mining explosives and pyrotechnics market size was valued at over USD 6 billion in 2015. Mining dominated the end user base in 2015. Increasing ores, minerals and energy demand are the key factor driving industry growth for this segment. Mining and exploration is the lifeblood of business dependent on finite resources such as jewelry. Rising consumer demand for opulent minerals such as diamond, will drive industry growth. Furthermore, growing oil & gas industry in the Middle East shall favor industry growth over the forecast timeframe. North America, led particularly by the U.S. explosives and pyrotechnics market size, was valued at over USD 4.5 billion in 2015. The regional growth is mainly driven by increasing government spending in arms & ammunitions to strengthen their defense forces. Shale gas exploration in the U.S. will boost industry growth for mining applications. Furthermore, presence of major companies in the U.S. engaged in pyrotechnics will favor business growth. Asia Pacific, mainly led by China and India, dominated the market share in 2015. The presence of major mining industry players in Australia along with presence of gold & coal reserves were the crucial factors for the regional growth. The global explosives and pyrotechnics market share was competitive in 2015. Key industry players engaged in product manufacturing includes Orica Mining Services, ENAEX, Sasol Limited, AECI Group, Incitec Pivot, Austin Powder Company and Chemring Group. Other prominent industry share contributors are Titanobel SAS, Hanwha Corp., LSB Industries, Solar Industries India, Melrose Pyrotechnics, Zambelli Fireworks, Pyro Company Fireworks, Angelfire Pyrotechnics, Howard & Sons, Skyburst, Entertainment Fire-works, Supreme Fireworks, Celebration Fireworks and Impact Pyro. Majority of the industry participants are engaged in commercial explosives export to meet the increasing product demand globally. For instance, Orica Mining Services exports the product and has presence in over 100 countries. In addition, the industry players are involved in production capacity and geographic presence expansion to tap the industry whitespaces. Commercial explosives are extensively used in construction and mining projects to break huge rock into simpler pieces. Construction and mining projects are highly dependent and are not feasible without explosives usage. Mining is carried on an escalating rate to meet the growing minerals demand. For instance, coal, cement, steel, aluminum, copper and various other metals are the elementary needs of any country. The supply of all these necessities depends extensively on explosives. In addition, majority of explosives manufactured globally are consumed by the mining sector. Mining sector is witnessing promising gains in Africa owing to availability of natural ores and minerals in the region. The global explosives and pyrotechnics market size is contributed by increasing military spending in the U.S., Europe and Asia Pacific. The countries in the region are engaged in upgrading their military strength. Explosives plays a crucial role in arms and ammunition production. 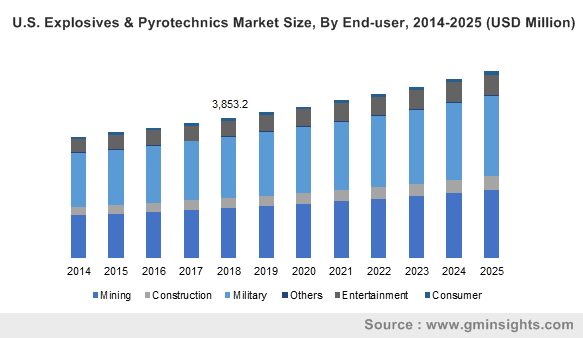 Pyrotechnics industry is likely to witness average industry growth over the forecast timeframe. Fire shows have been an integral part in function such as opening ceremony of any sports events. This will boost industry growth by 2024. However, stringent environmental legislations related to explosives fumes, which are harmful for the biodiversity, may hamper industry growth in the near future.